With 41 branch locations and over 1800 associates scattered across the U.S., Penn Mutual needs reliable connectivity—always. More and more associates were relying on Internet-hosted applications for everyday tasks, and it was clear their existing network wouldn’t be able to accommodate that. 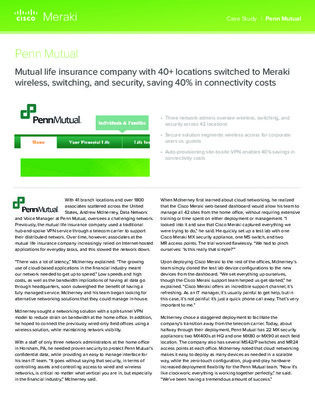 Learn how Penn Mutual upgraded to a secure, always-on network with the help of Cisco Meraki and got reliable access for associates and guests.